I am in the middle of running a huge fundraiser for my daughter, and the kids are in the thick of spring activities, so I forgot to blog about my latest book. 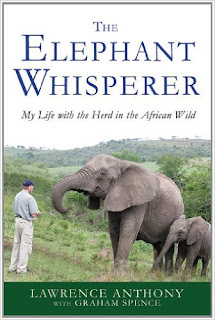 This is a story told by Lawerence Anthony - a man who has devoted his life to animal conservation in Africa. It is a true story - his own and how he came to be the owner of 9 elephants on his Thula Thula conservation land in Zululand, South Africa. They were a herd of rogue elephants who continually escaped their former home, watched their matriarch be shot due to her antics, and then had to be moved 600 miles away to a new land unfamiliar to him. Anthony's ability to settle these large beast and have them thrive was nothing short of amazing. I loved this book. I have always had a love for Africa and for Elephants. These are my daughter, Finley's, favorite animals, and she and I have on our bucket list to visit Africa in the new future (and I think Thula Thula will definitely be a stop). The story is well written and well told. He is very honest about how dangerous his work is, and that these are not pets, but wild animals. He is a man that saves even a deadly mamba snake - his heart is only in the preservation of these animals in their natural habitat. With Man continually closing in, more and more animals are becoming extinct and ending up in zoos, and people like Anthony are trying to stop that from happening. I encourage you to read this book. IT was wonderful.